The chapters in this volume can be grouped into three parts. Part I provides an introductory course in the design and operation of computers and computer systems. It conveys a knowledge of the basic principles of computer systems along with perspectives on the history and future of computers. The study of algorithmics is contained in Part II including matrix computations, fundamental algorithms and data structures, design and analysis of efficient algorithms, and computational complexity. 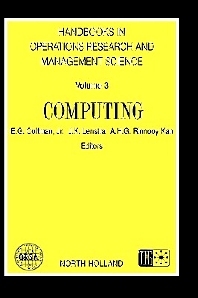 Part III brings out the relation between computer systems and operations research applications. This volume was designed and written for use in the operations research and management science community. Apart from the background provided by the first five chapters, the emphasis is on the computational tools, algorithms, languages, and systems that assist the problem solver. Thomas M. Coffman, M.D., is an Associate Professor of Medicine in Durham, North Carolina. Duke University and Durham Veterans Administration Medical Center, Durham, North Carolina, U.S.A.